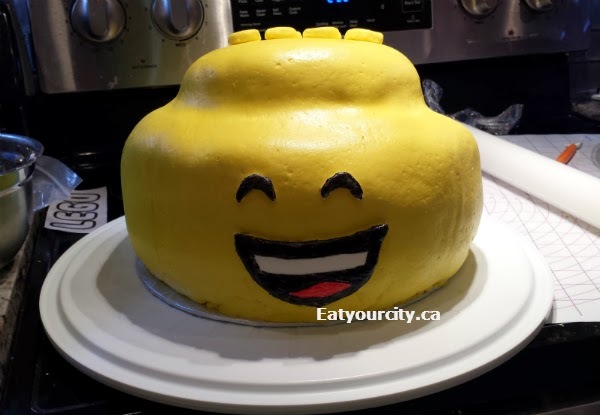 Eat Your City: How to make 100% butter buttercream and icing a fondant covered LEGO minifigure head cake from start to finish Part 2! How to make 100% butter buttercream and icing a fondant covered LEGO minifigure head cake from start to finish Part 2! Posted by So, you've made your cakes and they're nice and cool and ready to frost them before popping fondant on it (if you're feeling adventurous). I baked 3 pineapple sheet cakes the night before... I only needed two, but I baked a third one for good luck. (Recipe and part 1 with baking/storing cake tips here). I'm scribbling down my lessons learned from trial cakes and the actual cake I served my friends so when I get old, crotchety and can't remember a darn thing, at least I can bake a cake, ice it and eat it too hahahaha! There's lots of different icings out there... from glossy beautiful icings out there that involve egg whites, looks fantastic but is temperamental and fussy to make... and then there's the basic buttercream that tastes great, but trades off being super easy to make for a matte look. Making buttercream is pretty easy... it involves unsalted butter, lots of icing sugar, a bit of water and flavoring. Some like to swap out some of the butter with vegetable shortening - this make it more stable in places with warmer temperatures, but I find it really affects the flavor. You're putting in this much effort, just use all butter butter buttaaaaa! Not too many pictures of the process as I was elbow deep in buttercream when I was crumb coating, then icing. 1) Do use softened butter. Take the unsalted butter out of the fridge and let them come up to temperature for a few hours. You can cube up ice cold butter, but you'll really punish your mixer. I used a Kitchen Aid pro 600 and heehee.. even it shook and rattled a bit when I tried dropping in ice cold rock hard sticks of butter and beating it up on high. 4) Make a thicker, stiff consistency with more icing sugar for cakes that will be covered in fondant... you don't want the icing getting forced out by the weight of the cakes.. and having your cake's back end blow out. Yup, it happened to me.. right as I was finishing putting on the final touches and had to rescue it! 5) Use gel or paste colorings if you have on hand. liquid works, but keep in mind your icing will be runnier since you're adding more liquid. I like the ones from Americolor.. I have an Wilton icing color paste set that will probably last me forever as you don't need to use very much each time. 6) Flavorings: I like using the concentrated liquid candy flavorings. You only need a few drops so you don't have to worry about the icing consistency changing. I used this concentrated candy flavoring and it was fine, though I didn't like how there wasn't a dropper or narrowed opening so had to wipe up scented drips. 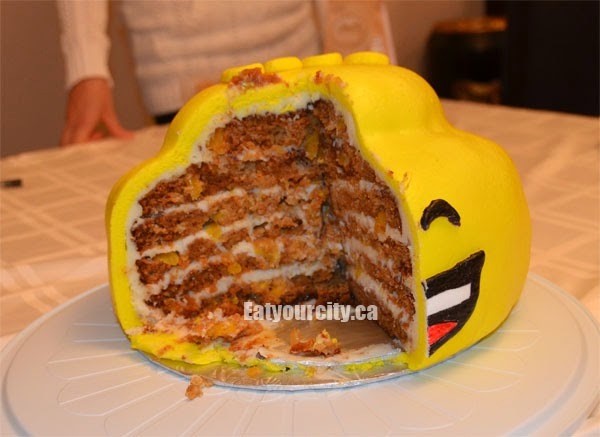 -Glob a fist sized glob into the centre of the cake and using a flat spatula (or flat and bent spatula) and "waving" motions, spread the buttercream evenly all over the top of the cake and push extra over the sides. -I found while this method requires more effort to dig out a huge icing tip, a large icing bag, packing the icing into the bag, it does make icing the sides a lot easier, and it makes it a breeze to do swirls of icing and alternate with a different colored/flavor of icing or fruit goo on the cake top layers if you want to get really fancy. -again, using a warm dry and clean flat spatula, smooth out the sides and top of the cake as noted above. 1) In large bowl, cream butter with paddle attachment on electric mixer. Add in vanilla or whatever flavoring you're using and 2 tablespoons of water. Gradually add sugar, one cup at a time, beating well on medium speed. Stop the mixer and scrape sides and bottom of bowl often. 3) Keep bowl covered with a damp cloth or plastic wrap until ready to use. Refrigerated in an airtight container, this icing can be stored 2 weeks. Rewhip the heck out of it before using.